Note: I created this website a few years ago and it has remained dormant since 2015. I have focused on my business website Design TLC, and blog there more often, mostly about business and WordPress. I am reviving this old site in order to hold myself accountable and make my health more of a focus by blogging about it. Today I began the Total Wellness Challenge. Since this is a website/program in which I have invested a lot of time and energy as a website developer, I know it pretty intimately. I am a proponent of the healthy lifestyle habits it helps to create and think Ginny Wright is amazing! Since I have participated in every Challenge since it began, I started to take it for granted. The last couple of times I did the TWC, I didn’t take it very seriously. I wasn’t overly concerned with posting perfect points and cut myself a lot of slack. While I maintained many of the healthy habits I learned on previous challenges, I also let go of some that I should have continued. For the last year and half (or more! ), I have been consumed by work, sick of meal planning, shopping and cooking, and tired of making dinners when no one (including myself sometimes!) was home to eat them. Eating healthy takes a lot of time, planning and attention, and has not been a priority. I have managed to maintain my weight, with a combination of exercise, and not eating much at all during the week because I rarely stop working to eat! I am happy to say enough time has passed since I took the TWC seriously that I am now really thrilled to be doing another Challenge and reset my mind and body. I am motivated to follow all the rules and to post my score more accurately. 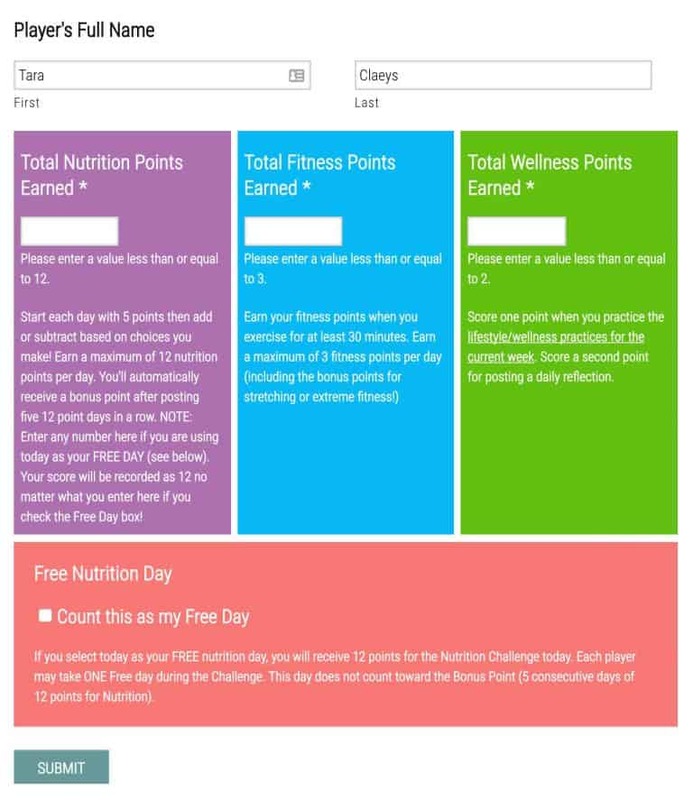 What is the Total Wellness Challenge? I have been inspired by Jennifer Bourn’s Inspired Imperfection blog as she participates in the Whole30. She has been writing about her recipes, how she is feeling and what has worked and not worked for her and her family. Taking a cue from her, I am gong to document my journey through the Spring 2017 Total Wellness Challenge. I am hoping this will help make the TWC more of a focus for me over the next month. Since today was the first day, it was easy to have a clean slate and take charge of my habits. I went for a speed workout run at the track at 5:30am with some women from my running group. We run a warm up lap, and then 3 sets of 2 laps at a pace of about 3:50 for the 2 laps. In between each set of 3 we do a rest lap, running a bit slower. The whole process takes about 40 minutes. On the way home from the track, I stopped at the grocery store and picked up a large bag of carrots, snow peas, baby cucumbers, frozen mixed fruit, grapes, 2 sweet potatoes, green onions and baby carrots. I had purchased some food over the weekend, but realized I did not have many vegetables on hand. I am good about eating leafy greens while on the TWC, but often have a hard time fitting in other vegetables. I made a green smoothie when I got home, with “power greens,” a carrot and some of the mixed frozen fruit (mangoes, strawberries and blueberries). I added some plain greek yogurt and a splash of almond milk and some water. I also made some oatmeal with chia seeds, chopped apple and cinnamon. I find that for me, prepping dinner in the morning when I am in the kitchen making breakfast is the best way to ensure I will eat a decent meal. 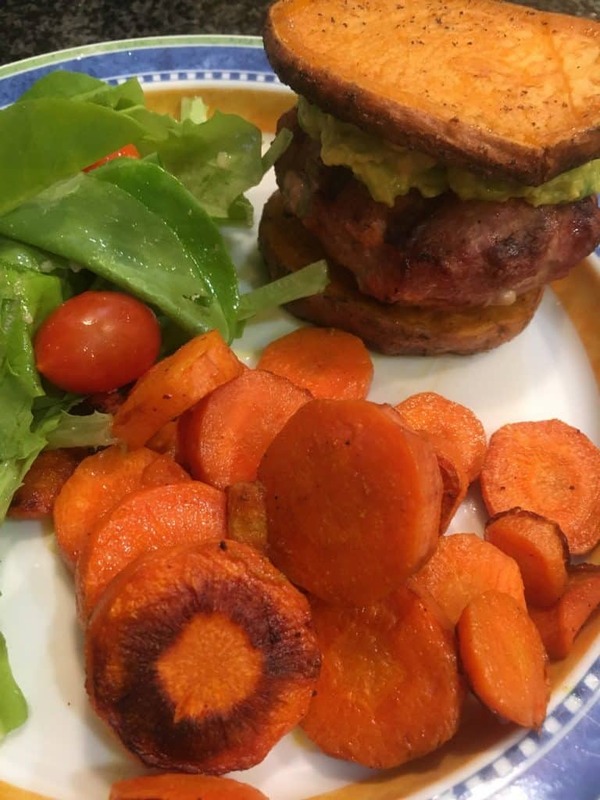 I had seen Jennifer Bourn’s recipe for turkey burgers with sweet potato buns and had taken out some frozen ground turkey over the weekend, without a plan for what I would use it for – this seemed to be the perfect thing to try. I chopped up some green onion and quickly grated some carrot and mixed it with the turkey, added salt and pepper, and formed 4 small burgers. I put them in a container in the freezer for the day. I also peeled and sliced up about 6 large carrots. I put them in a container with some olive oil and Tumeric to roast on a pan on the grill while I cooked the burgers at dinner time. One of the Lifestyle points which can be earned is for posting a Reflection. I took a moment to add a comment about how I was feeling motivated and excited to participate in the TWC. I had a hard boiled egg midway through the morning, as well as some coffee with almond milk (I held off on the coffee to give me something to look forward to!). Today was an unusual work day for me. I typically spend the whole day at my desk/computer without much of break. I was excited today to meet up with a woman who I knew from my online WordPress community but had never met in person. She was in town on business, so we made a plan to meet for lunch and some sightseeing. It was so much fun to have a face to face visit and we had a great day! We could have talked for hours about life and work. She was excited to be in a city with many dining options, and we both chose Chop’t for lunch. This was a perfect place for a TWC Challenger … I had a huge salad with avocado, fresh corn, black beans and cucumber. I had plain oil and vinegar since I wasn’t sure, but would assume, their dressings contain sugar. I had salad leftover and will enjoy it tomorrow. We had a nice time walking around some Washington, DC monuments on a sunny but hot afternoon. I was hungry when I got home so had an apple with a Tablespoon of peanut butter before getting to work and answering emails. At dinner time, I got the grill heated and took the burgers out of the freezer. I used an older cookie sheet, and placed the carrots on that, as well as the sliced sweet potatoes, brushed with olive oil, salt and pepper. Everything cooked nicely on the grill and was ready in about 20 minutes. We are growing lettuce and arugula in our garden this spring, so I had some fresh lettuce with some grape tomatoes to go with dinner. I topped the burger with some guacamole, which is really just a mashed avocado with green onion, salt and pepper. It was all delicious! I finished off with some watermelon and blackberries and then brushed my teeth so I wouldn’t eat any more! I did a 10-15 minute stretch while watching the Capitols hockey game. Stretching is the hardest part of the Challenge for me. I almost never earn the second fitness point. But I am determined to stretch every day on this Challenge, and am hoping I feel better and continue beyond. This week’s Lifestyle Challenge is to “declutter” for 15 minutes each day. I had a pile of clothes in my closet that needed to be sorted and put in proper places, so I took care of that this morning. I also put away a few stray things in my office and wrote some notes to clients while watching the hockey game in the evening, which has been “cluttering” my To Do list for a while, so it was great to take care of that. All in all Day 1 has been a success and I am ready for tomorrow!